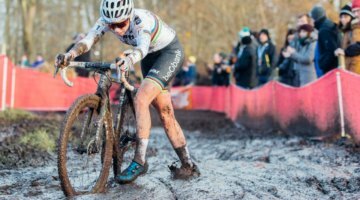 MOL, BELGIUM—Capitalizing on Sanne Cant’s absence, Jolien Verschueren (Young Telenet-Fidea) was able to take the win in a wide-open Elite Women’s field at Zilvermeercross. Verschueren suffered a slower-than-usual, and took the first few laps to work her way up to the leading group, featuring Elle Anderson (SRAM / Strava), Sanne van Paassen (Boels-Dolmans), Sabrina Stultiens (Rabo-Liv) and Laura Verdonschot (Kalas-Essers-NNof). 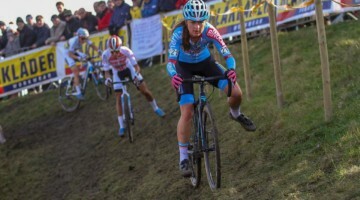 Verschueren quickly made her way by her rivals and took the victory solo, followed by Stultiens and van Paassen. American Elle Anderson finished sixth after a strong start, and fellow American and CXM Contributor Christine Vardaros finished 20th. 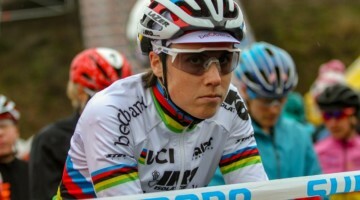 Cant was sidelined by a torn muscle in her ribs, suffered in a crash. 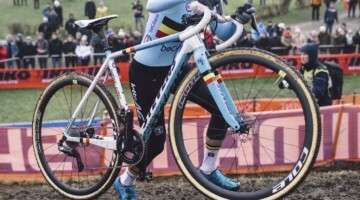 Be sure to check out our Zilvermeercross Elite Men’s race report to read about Wout van Aert’s win—his twelfth of the season.